Guillaume started his job on Tuesday, October 16. After almost 6 months of not working, he was excited... but he also didn't want to go! This is the front door of the restaurant. When they move to the Mandarin Oriental next summer, the front door will also move. It's very pretty! He arrived at 3:00 p.m., and met some of his new colleagues. He "shadowed" a server for the evening, and learned a little about how L'Espalier works. The person who is responsible for providing guidance and training recently left the company, so the training is a little less structured right now. 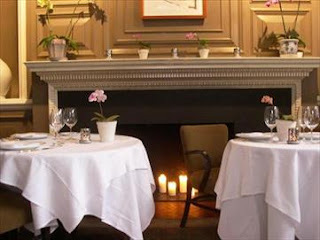 This is the inside of one of the rooms (we didn't take any of these pictures - they're borrowed from websites online). Over the last few days, Guillaume has been learning about the different dishes, how they're prepared. But mostly, he's been learning about all the wine. Yesterday, he spent the entire morning online investigating wines that are on the menu. I think he likes his job!! Meanwhile, Angela has become a "lady of leisure", staying home, watching tv, playing PS3! Her mom is coming into the city to visit this afternoon. Last week, we were watching a football (soccer for the Americans) match that was on the Faroe Islands. We wanted to learn a little about the islands, so Angela googled it, and found that there are Puffins on the island. Angela then googled the Puffin, and fell in love with another Fat Fatty! 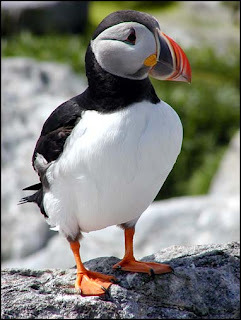 We found out that the Puffin also lives on Bar Harbor, where we spent 4 days in August. We didn't see any Puffins, and now Angela wants to go back. There are websites where you can "adopt" a Puffin, and they send pictures, and tell you where they are. But it was $100 to adopt one, and since we can't take it home with us, we decided not to adopt!